Nativity of St. John the Baptist Orthodox Church, O.C.A. NOTE: Agape Vespers on 4/28/19 will now be at 11:00 A.M.
Fr. Michael is a retired Navy Chaplain. Fr. Michael and Matushka Linda. Committed to bringing God's eternal truth and life to a diverse community, ministering to their spiritual/related needs via prayer, education, liturgical/sacramental services, and charitable outreach programs, thay they might experience God's Kingdom here and now, and for all eternity. 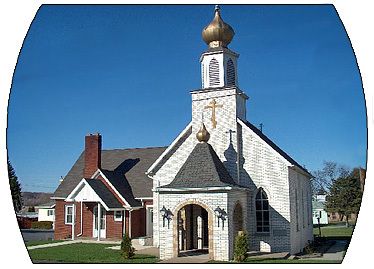 Nativity of St John the Baptist parish is located in Philipsburg (Chester Hill), Clearfield County, Pennsylvania approximately 25 miles north and west of State College and 35 miles north and east of Altoona. See Current bulletin for specific schedule for the month. The Mystery of Holy Confessions is offered after Vespers or by appointment. Sonya Brennish, George Sura, Ivan Switala (Council Members). Mrs. Shirley Foster-Donovan, Director; Elizabeth Blake, Svetlana Blake, John Conkey, Mary Ann Conkey, Mike Conkey, Doug Donovan, Judy Everly, Bonnie Fetcenko, Rose Marie Fetcenko, and Andrew Tocimak. Church School schedule will be determined. Take I-99 north to junction with Rt 350 at Bald Eagle. Take Rt 350 12 miles to Philipsburg. Turn left onto Presqueisle St (this occurs at a traffic signal located next to the central park in town). Proceed straight through two traffic signals (after making the left above) and follow the road across railroad tracks, over a bridge, past J J Powell Oil Distribution Center and the Little League field (all on the left) until the T intersection. Turn left onto Laura St, and the Church is about 50 yards on the left. Take I-99 south to exit for Rt 322 west near Port Matilda, and follow 322 west (note that I-99 will proceed south to Tyrone and Altoona). Follow Rt 322 west for 12 miles to Philipsburg. At the traffic light, turn left onto Presqueisle St. Proceed straight through three traffic signals (after the light above) and follow the road across railroad tracks, over a bridge, past J J Powell Oil Distribution Center and the Little League field (all on the left) until the T intersection.. Turn left onto Laura St and the Church will be about 50 yards on the left. Exit 133 (old exit 21), Kylertown. Take Rt 53 south toward Philipsburg. Turn left at the traffic light in Philipsburg (Harbor Inn & Sheetz is on the left). Proceed to the 2nd traffic light and turn right onto Presquisle St. Proceed straight through one more traffic signal and follow the road across the railroad tracks, over bridge, past JJ Powell Oil Co until the T intersection. Turn left onto Laura St and the Church will be about 50 yards on the left.